1. 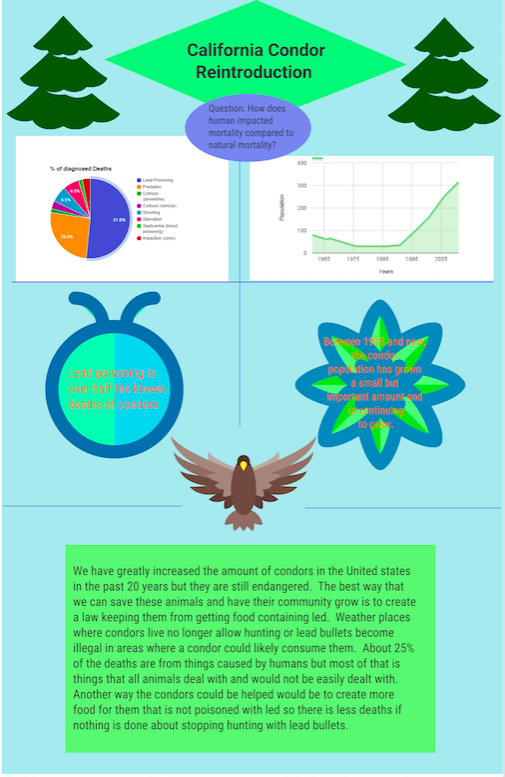 In this project I learned a few skills with building infographics and group effort. I think the most helpful skill while doing this project was research skills. When we made our paper and our infographics it took some work to find enough reliable information to write your paper. 2. The two most significant things I did during this project were writing my conclusion and making my infographic. When we wrote our paper everyone in our group had a section to write. My section was the conclusion, this was fine but I had to wait for the rest of my group to finish the paper before I could even start my conclusion so I think I helped my group in that way. This was also something I had a difficult time doing because I had a shorter amount of time. I had some difficulties focusing in class just because I had a somewhat of a fun group and i'm easily distracted in class. I think that generally I have a good attitude towards everything and I think that helped my group in the way of just keeping us on track and focusing on what we had to get done. One assumption that I confirmed while working on this project is that Memo is a very distracting group member. I learned a lot from everyones work about endangered animals and problems with our ecosystem. In my project, I knew the California Condor was endangered but I had no idea it was such an effect from us and how much f the problem was simply from lead poisoning. Something I would do differently if I were to redo this project is choose an ecosystem problem more closely related to Colorado or Durango so that people would have more of an understanding while at exhibition. 3.I really like animals and at some point would like to work in that area. I think doing this project helped me understand more about writing these types of papers. I also learned some things about animals that I didn't previously know about. I wish I had a little more skill and experience with making infographics. I also wish I had had more background information on the condor prior to starting this project. I liked all the activities in this project and I think I took a lot in from all of them except all the note taking. In this project I got more experience with working in groups and on my own. This will help me with future group projects and with being better at researching information for a project.